Six to nine armed criminals surrounded IDF patrols - who shot back and killed a number of their attackers. New details are emerging about Wednesday's skirmishes on the Egyptian border on Wednesday night, which saw gunmen open fire on IDF forces along the border line. The attackers, initially believed to be terrorists, were in fact criminals smuggling drugs, military officials have revealed, and fired at IDF vehicles on all sides using anti-tank missiles from three different directions. Egyptian military sources have confirmed that there between six and nine attackers in total. One armored vehicle near the border fence fired at an IDF vehicle patrolling the area and two additional vehicles circled the IDF patrol, to "distract" the patrol and allow the drugs cargo to be spirited across the border. However IDF forces fought back, shooting all of the 6-9 gunmen and killing half of them. 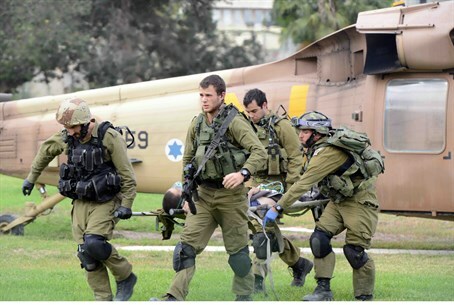 Two wounded soldiers were evacuated by helicopter for further medical treatment at Soroka Medical Center in Be'er Sheva after receiving first aid at the scene. One of the wounded has been confirmed to be from the Carcal Battalion. She is suffering from serious injuries and is now in Soroka's Intensive Care Unit (ICU) on a respirator. The second soldier suffered light injuries.